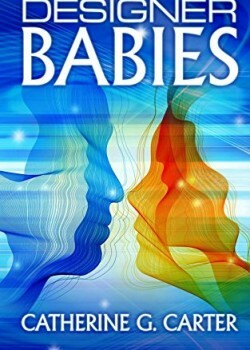 Designer Babies by Catherine G. Carter is a thought provoking science fiction novella. It is the second story penned by Catherine G. Carter, a talented high school student and classical pianist. Set in 2099, the story tells of a future society that, having witnessed the horrors of the past, has decided it is better for the future of the human race for babies to be genetically engineered. Now parents can have designer babies, presented as government-approved DNA packages, physically perfect in every way, and tailor-made for the lives they are to lead. However, nature is still in evidence, and babies are continuing to be conceived in the natural way. The government-funded Thaed Industries has been set up to eradicate these natural-born babies and ensure the genetic purity of the general populace. However, despite their best efforts, some have slipped through the net, and their instinct to survive is strong, against the odds. Veracity Fitzpatrick is a natural-born, orphaned, on the run, and striving to ‘fit in’ at her new school. However, at 17 she is finding herself not only having to pretend to be someone she is not, but also having to come to terms with new emotions, as she develops feelings for a fellow student, Michael. Michael appears to be the perfect friend, open and protective, and his winning ways eventually disarm her. She opens up to him about herself and agrees to spend the holiday with him and his parents. However, it is not until she arrives at his house that she discovers she recognises his parents, and that Michael himself harbours his own deep secret. In this enthralling story the reader is first of all lulled into accepting the concept of designer babies, perfect children for your lifestyle, something which is in the news even now. As the author takes us through the story, we realise that this is just the tip of the iceberg; what else will the scientists do? In 2099, as now, the public see what the scientists and governments want them to, and people believe what they are told. Behind closed doors, in secret locations, ‘progress’ is happening, trials and experiments continue, and the only people who are privy to what is going on are those who are in charge, or who are participating. Free will has been around for millions of years; can it truly be eradicated, or will it survive? What will the future hold?